The first film by Yorgos Lanthimos, the director of DOGTOOTH and ALPS. Kinetta. A defunct Greek resort town, inhabited during the off-season by migrant workers. In this drab off-season resort town, Lanthimos studies the cryptic activities of an inscrutable trio (a policeman, a photographer, and a hotel maid) who barely speak and who pass the time by staging reenactments of murders. Second Run's DVD of KINETTA will be the first home video release of this extraordinary film anywhere in the world. Amazon pre-order. Release date: September 29th. Our KINETTA Scalarama screening just got better! 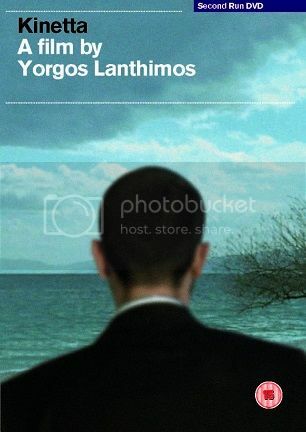 Delighted to confirm that the film will now screen from director Yorgos Lanthimos' own personal 35mm print! KINETTA 35mm screening + Director Q&A, Sunday 21st at 5:30pm at Tate Modern. Tickets just £5!! Appreciated seeing this on 35mm. Thanks! • Presented from a new HD restoration of the film, approved by the director. • ‘In conversation’ - a new and exclusive filmed interview with director Yorgos Lanthimos filmed at London’s Tate Modern. • Booklet featuring a new essay on the film by writer and critic Michael Ewins. Bikes, is there any chance of Second Run putting up HD versions of some of their films to buy on iTunes? RossyG wrote: Bikes, is there any chance of Second Run putting up HD versions of some of their films to buy on iTunes? Unlikely in the very near future, RossyG, but will be under discussion. Rest assured that we will inform everyone well before any such moves are made. Fortuitously - but unplanned - Yorgos Lanthimos' KINETTA is out today on the date of the Greek voting seismic result! "A lost masterpiece, to be enjoyed by those who crave something more than just one-way entertainment from a film... this unique and fascinating film"
Great to see Yorgos Lanthimos' new film THE LOBSTER getting raves at Cannes! Can't wait to see it. Congratulations on the (deserved) Academy Award nominations for Yorgos Lanthimos and Efthimis Filippou for their screenplay of THE LOBSTER. - it all started with KINETTA !